What if you are like a pitcher or vessel that holds water and God decided that He wants His Spirit (or water) poured into the Presidents glass at the White House? It would be an honor to be elevated to such a position;the fact that God used you to be His vessel is humbling, but now He is calling you to pour His water into a toddlers cup at the nursery in the local church…is that any less of an honor? We are to be lead by the Spirit of God. Being used by Him will take us to what society or the natural mind or our flesh considers great places, but then that same Spirit will lead us to places that seem like a misuse of our gift or a step down. 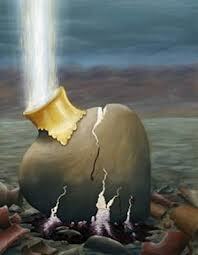 When you submit yourself to Him as a vessel you are to pour out His water or Spirit wherever He leads. Do not let what you see be the authority of where God is taking you…listen to His voice…become sensitive to His Word. You are not to put stock in what you see because what is visible is fleeting, fading, and only here for a season, but His Word will not pass away. Faith, Hope, and Love are eternal things…this is what we walk in…the invisible…we are simply vessels that hold His Spirit and as vessels we are to pour out His Water wherever He leads. Do you consider yourself to be a vessel? This entry was posted in Uncategorized and tagged apostle, Eric, EricHaylock, Haylock, last, lastapostle, poem, Poetry, spoken, spokenword, word. Bookmark the permalink.